Alpha-hemolysin, a self-assembling bacterial toxin. In its fight for resources, bacterium Staphylococcus aureus secretes alpha-hemolysin monomers that bind to the outer membrane of susceptible cells. Upon binding, the monomers oligomerize to form a water-filled transmembrane channel that facilitates uncontrolled permeation of water, ions, and small organic molecules. Rapid discharge of vital molecules, such as ATP, dissipation of the membrane potential and ionic gradients, and irreversible osmotic swelling leading to the cell wall rupture (lysis), can cause death of the host cell. This pore-forming property has been identified as a major mechanism by which protein toxins can damage cells. The name alpha-hemolysin derives from early observations that established lytic activity of the toxin on red blood cells. It is expected now that, if applied in sufficient dosage, alpha-hemolysin can permeate any mammalian cell membrane. Although for most of the human population secretion of alpha-hemolysin does not pose a serious health risk, severe staphylococcal infection can cause hemostasis disturbances, thrombocytopenia, and pulmonary lesions ( ). The crystallographic structure ( ) of the assembled alpha-hemolysin revealed a heptametric organization of the channel. The protein has a mushroom-like shape, with a 50A beta-barrel stem protruding from the cap domain through the lipid bilayer into the cell's interior. 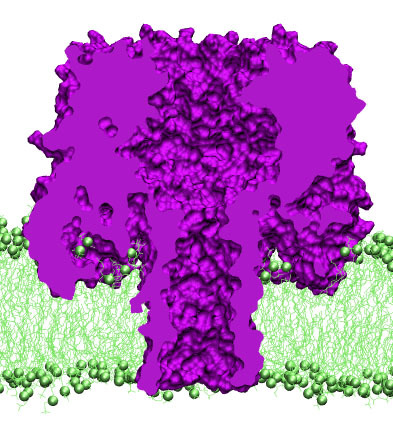 The cap of the protein conceals a large vestibule connected to the cell's exterior through a large opening at the top of the cap. The narrowest (1.4~nm in diameter) part of the channel is located at the base of the stem, where the beta-barrel pore connects to the vestibule. Seven side channels lead from the vestibule to the cell's exterior, exiting near the membrane surface. The figure illustrates the 268,000-atom model of alpha-hemolysin in its native environment - a lipid bilayer. Click here for a movie (mpeg, [an error occurred while processing this directive]) showing alpha-hemolysin assembled with a lipid bilayer. Several properties of alpha-hemolysin make this membrane channel suitable for various biotechnological applications: assembled alpha-hemolysin is stable over a wide range of pH and temperature, its transmembrane pore stays open at normal conditions, alpha-hemolysin can bind to various biological or synthetic lipid bilayers, the binding proceeds spontaneously and does not require specific ionic conditions. Delivery Systems. The transmembrane pore of alpha-hemolysin can facilitate controlled delivery of ions and small organic compounds such as sugars or nucleotides across a cell's plasma membrane or through the walls of synthetic lipid vesicles. Using genetically engineered alpha-hemolysins, for which assembly and conductance can be triggered or switched on or off by external biochemical or physical stimuli including light, a lipid bilayer can be made permeable for small solutes at will ( , ). Stochastic Sensors. Suspended in a lipid bilayer, an alpha-hemolysin channel becomes a stochastic sensor when a molecular adapter is placed inside its genetically re-engineered stem, influencing the transmembrane ionic current induced by an applied voltage bias. Reversible binding of analytes to the molecular adapter transiently reduces the ionic current. The magnitude of the current reduction indicates the type of analyte, while the frequency of the current reduction intervals reflects analyte concentration. Such stochastic sensors were demonstrated to simultaneously measure, with a single sensor element, concentrations of several organic analytes ( ) and solution concentrations of two or more divalent metal ions ( ). The nanometer size pore of alpha-hemolysin was used in another type of stochastic sensor to simultaneously determine concentrations of two different proteins ( ). DNA sequencing. The transmembrane pore of alpha-hemolysin can conduct not only small solutes, but also rather big (tens of kDa) linear macromolecules. Thus, driven by a transmembrane potential, DNA or RNA strands can translocate through the pore of alpha-hemolysin, producing the ionic current blockades that reflect the chemical structure of individual strands ( ). Statistical analysis of many such blockage currents allowed the researchers to discriminate different sequences of RNA ( ) and DNA ( ) homopolymers, as well as the segments of purine and pyrimidine nucleotides within a single RNA molecule ( ). A single nucleotide resolution has been demonstrated for DNA hairpins ( , ), raising the prospect of creating a nanopore sensor capable of reading the nucleotide sequence directly from a DNA or RNA strand. Click here for a movie (mpeg, 3.9M) showing electrophoretically-driven translocation of a 58-nucleotide DNA strand through the transmembrane pore of alpha-hemolysin. Click here for a movie (mpeg, 2.9M) showing induced by a 240mV bias currents of K+ and Cl- ions through the transmembrane pore of alpha-hemolysin. Page created and maintained by Aleksei Aksimentiev. Contact Us // Material on this page is copyrighted; contact Webmaster for more information. // Document last modified on 19 Jul 2006 // 81187 accesses since 20 Mar 2006 .